I am so excited to finally be able to bring you the very first episode of Phoenix Fusion: Side Notes! We'll be taking some tired old side recipes and giving them one HECK of a makeover! 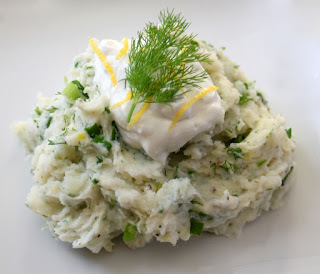 Mashed potatoes are so easy to make and go with just about everything...but they can also be VERY BORING!!!! These recipes are just in time for Thanksgiving so that you can turn up the volume times TEN on your mashed potatoes! Fill a large pot with heavily salted water. Bring to a boil and add the potatoes. Boil for 10-12 minutes, until soft when pierced with a fork. Drain the water and transfer the potatoes to a large mixing bowl. Add the butter and milk to the mixing bowl. Season with salt and pepper to taste and mix with an electric mixer for about 2 minutes, until the potatoes are smooth and fluffy. DO NOT over mix. Cover and set aside. Heat a large skillet on high heat. Add the chopped bacon, stir occasionally and cook on high heat for 7-10 minutes until the bacon is browned and crispy. Remove bacon from drippings with a slotted spoon and set aside. Add the mushrooms to the bacon drippings, season with salt and pepper, stir occasionally and cook on high heat for 7-10 minutes until the mushrooms are soft and browned. Remove the mushrooms from the bacon drippings with a slotted spoon and set aside. 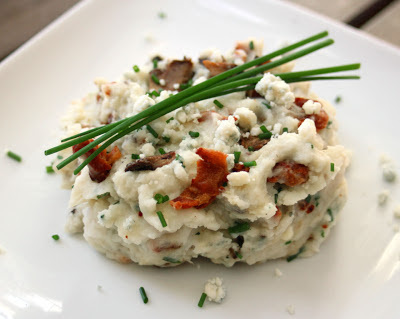 Add the blue cheese crumbles, cooked bacon and mushrooms and chopped chives to the potatoes. Adjust seasoning with salt and pepper and fold lightly with a spatula until mixed and all ingredients are combined. Serve with steak or other hearty meats. Add the olive oil and yogurt to the mixing bowl. Season with salt and pepper to taste and mix with an electric mixer for about 2 minutes, until the potatoes are smooth and fluffy. DO NOT over mix. Cover and set aside. Add the fresh dill, scallions, parsley and garlic. Adjust seasoning with salt and pepper. Fold with a spatula until all ingredients are combined. Serve with poultry or other light meats. Add the olive oil to the mixing bowl. Season with salt and pepper to taste and smash with a potato masher for about one minute, until potatoes are in small bits. DO NOT over mix. Cover and set aside. 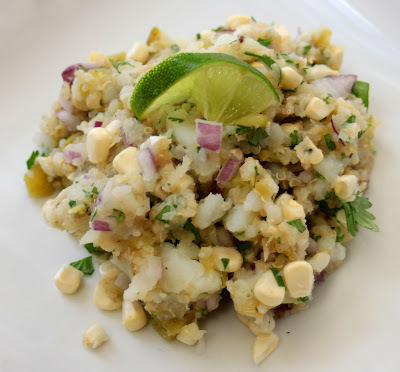 Add cooked Quinoa, corn, red onion, chopped jalapenos and cilantro. Season with salt and pepper and fold with a spatula until all ingredients are well mixed. Garnish with lime wedges before serving.